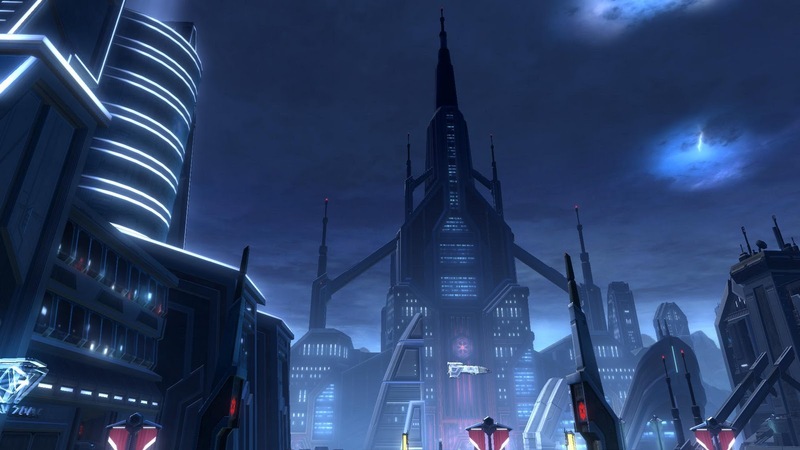 As you have probably heard, the NDA for Star Wars: The Old Republic has been dropped. The game officially launches in a little less than a month, so that gives us plenty of time to talk. Since TOR is such a huge topic, I'm going to break up my impressions about it into several posts. This one is about the games atmosphere. What do I mean by atmosphere? Mostly, how much does the world feel like Star Wars. Did they just slap Star Wars on some generic stuff and call it a day? I can honestly say, no way. The atmosphere of this game is just amazing. Instead of writing about it, lets look at some pictures. 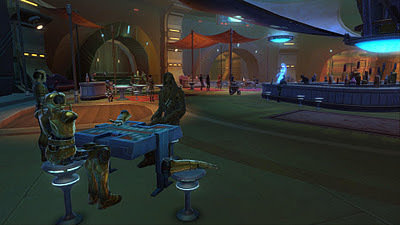 Here we have a cantina on Hutta. A Wookie has just played a now arm-less droid in a game of something. I'm guessing the Wookie lost. 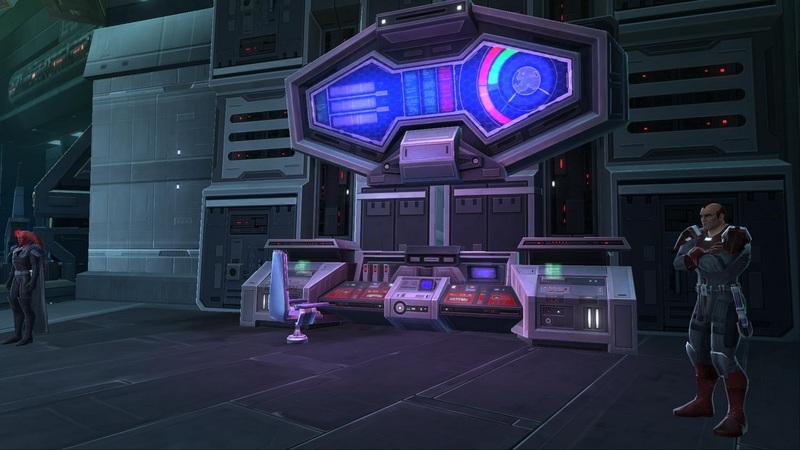 This screenshot was taken in a hanger bay located in the Imperial Fleet. In the background you can see Imperial ships moving around. 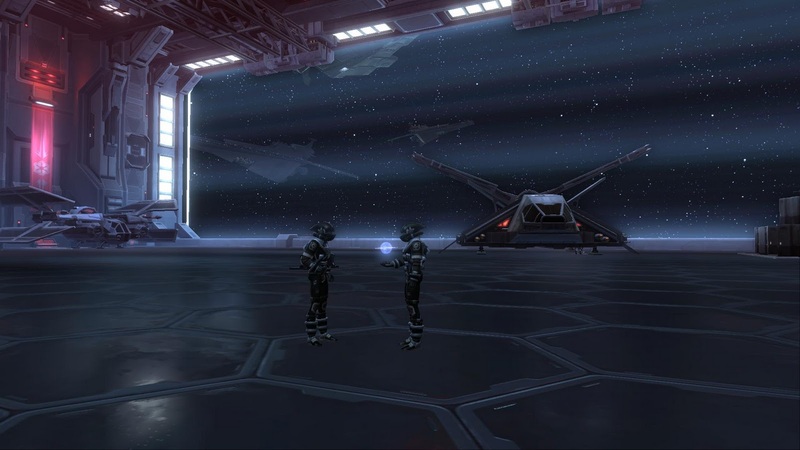 Two soldiers are discussing something while looking at a hologram. 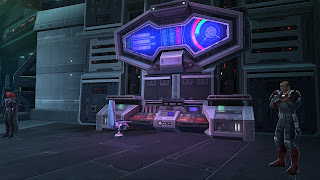 This is just a random computer terminal I saw in the Imperial Intelligence HQ. I love this kind of sci-fi stuff. A view of the Citadel on Drumund Kaas. This world is always covered in storms, and you can see lightning crashes. You can also see ship traffic flying around. This was just a small sampling of the views I've seen over the past couple of months. I'm constantly saying, "wow, that's cool" to myself when exploring the world. I am a fan of Star Wars in general though, so that may just be me.